Call it Pulav or Pilav Rice its the same.. No complications No jhat jhat… .Just as the name .. easy peesy. We had Chilli Soya ,Pulav Rice & raitha for dinner during the easter break for friends… I have learnt this recipe every since I have been a kid… All credits to my dear mommy for this one!! twice. Drain all the water and set the rice aside for 30 minutes. In the meanwhile, dice the carrots and French beans. Prepare the garden peas by soaking them in water. cashewnuts in the lowest setting, turning either side until light brown. Drain them onto a kitchen towel. along the vegetables for 2-3 minutes. leftover steam. Garnish with chopped coriander leaves and fried cashew nuts. along with Curry or a Raitha. My mom would cook them all up in the cooker.. and I prefer the open pot..
Use 2 Tbsp. Unsalted Butter if Ghee is unavailable. thank u for ur prompt comment sri.. there are normally too many spam comments..thats why the word verification came into action. Welcome back Sandhya! 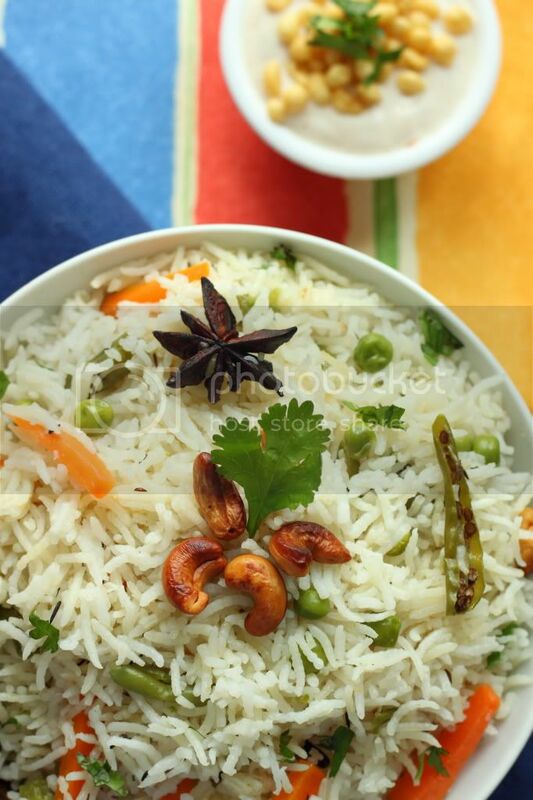 Pulao looks mouthwatering and I loved the 2nd click! Hey Sandhya, missed you. welcomeback. Glad that you had a wonderful time in India! 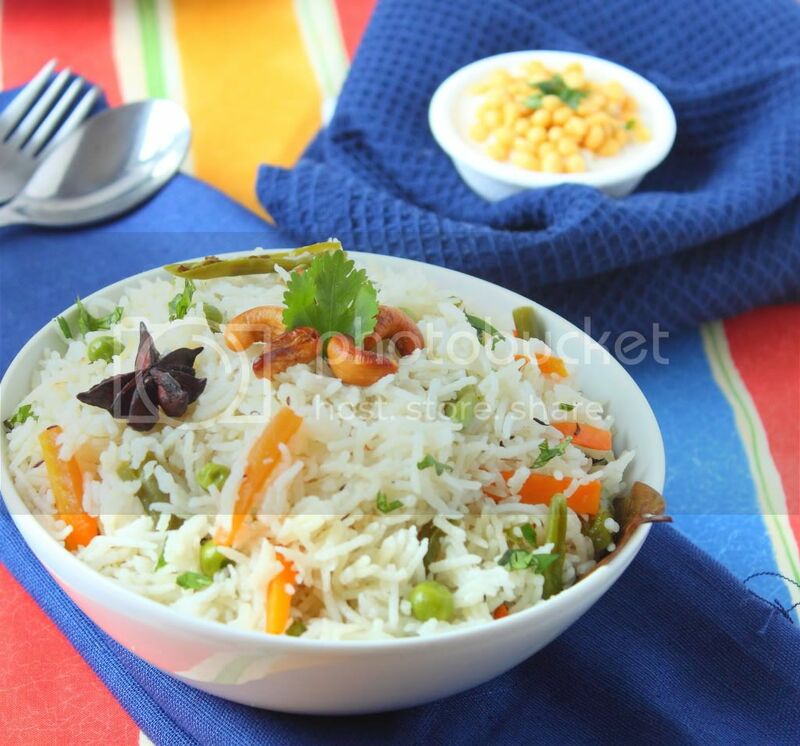 Jst posted veg pulav….urs look very tasty! hope u had a wonderful time ..
welcome back..this pulav looks so deliicous.really yum with chilli soy.. i always love to have it with simle raitha..
Pulav looks mouthwatering and I loved the 2nd click! tempting inviting and yummy delicious pulav. Delicious and colorful pulav, love the orange, green combo.Looks too good Sandhya..
That's a nice pulav, there. I love the pulav varieties for their easy preparation ; yet so rich. Ideal for a quick lunch box too. BTW, I am also back with blogging. I am waiting for ur full flow of recipes. I really wish we lived close by treating each other with both north indian and our authentic iyer recipes 😀 Hope we do get a chance sometime. 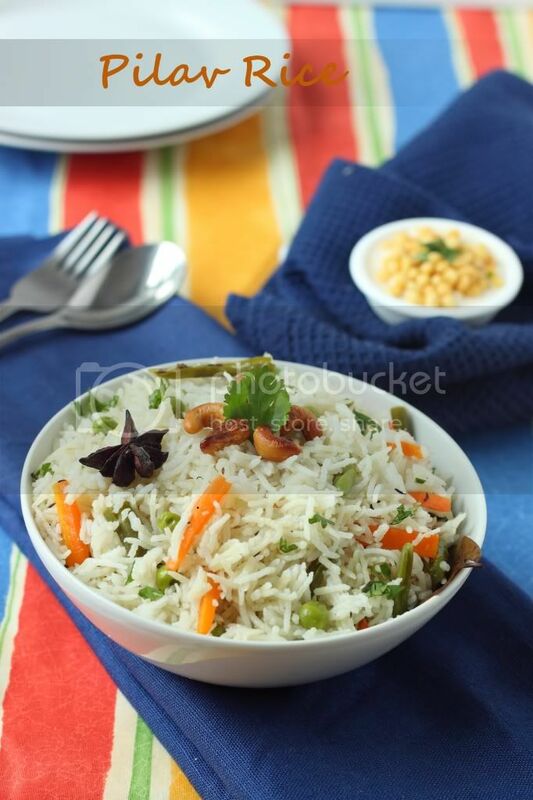 lovely pulao sandhya.Welcome back .soon expecting more intersting recipes from u.
delicious pulao and great clicks. I can access and coment here too…I have only IE browser now..will try other when I am back home on 9th July.